The latest versions of Dropbox and Adobe Acrobat Reader will make it easier to work with PDFs in Dropbox, offering editing, saving and syncing capabilities within both apps. 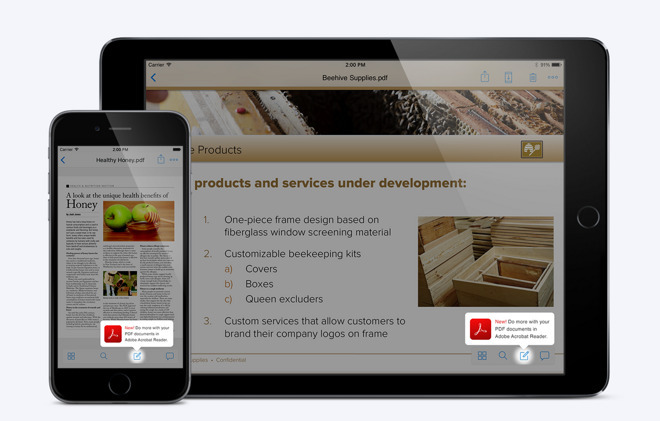 Users can annotate and comment on PDFs stored in Dropbox from their iPhone or iPad. Simply open a PDF from the Dropbox app, then tap the "Edit" icon, then editor or electronically sign the PDF in the Acrobat Reader app. Any changes made to the PDF are then saved to Dropbox. And in the new Adobe Acrobat Reader app, users can directly browse and open their Dropbox files. Annotations, edits and signatures are then saved back to the linked Dropbox account. More than 18 billion PDFs are stored in Dropbox accounts, which makes PDF the most common business file type seen on the cloud storage service. The update is part of a recent partnership between the two companies, which also brought Dropbox account support to the Adobe Acrobat and Acrobat Reader desktop apps last month. For now, the Dropbox and Acrobat features are exclusive to iOS on mobile devices. Dropbox said on Monday that the same integration will arrive on Android devices next year.